With temperatures ranging from -10 to 60 degrees, February has been one of the strangest weather months we can remember – but one thing is for sure: #TeamJAF’s Boston Marathon and New York City Half runners have been out on the streets training, rain or shine! Our NYC runners are less than a month away from taking Manhattan by storm, and our Boston runners won’t be too far behind, having just over seven weeks until Patriots Day! But training wasn’t the only thing JAF was up to in February – read more about the month that was below! As many of you know, the Joe Andruzzi Foundation has a deeply-rooted connection and commitment to raising awareness for the need to significantly increase research behind cures for pediatric brain tumors. Around 2001, we met an amazing, inspiring boy – C.J. Buckley – who had just been diagnosed with an inoperable brain tumor at Boston Children’s Hospital. Under the watchful eye of Dr. Mark Kieran, C.J. received the best possible care for his condition, and always remained courageous and upbeat. Since then, the Buckley family became part of our extended family, and when C.J. passed away in 2002 at the age 17, he truly left a hole in our hearts. In his memory, we wanted to do something lasting that would honor his courage and spirit – and from there, we created the C.J. Buckley Pediatric Brain Cancer Research Fund at Boston Children’s Hospital in 2003. 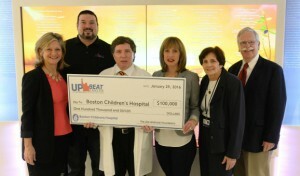 Earlier this month, Jen and Joe, Carter and Lucy Buckley along with Anne Furey – a JAF Board Member – visited Dr. Kieran at Boston Children’s Hospital to present the Joe Andruzzi Foundation’s annual $100,000 donation towards the C.J. Buckley Brain Cancer Research Fund. The visit marked our seventh straight year contributing to the fund, totaling $700,000 since 2009. Read more about our check presentation, and check out photos from our patient visit, on the JAF blog (here). 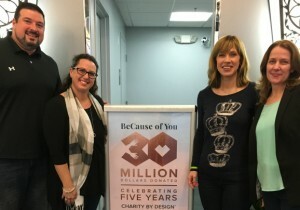 A few weeks ago the Joe Andruzzi Foundation celebrated the five-year anniversary of ALEX AND ANI’S® CHARITY BY DESIGN® initiative, as well as the company reaching $30 million in donations to its non-profit partners! CHARITY BY DESIGN was created in February of 2011 to ignite the ALEX AND ANI commitment in creating connectedness and community impact through giving back. The theme of ALEX AND ANI | CHARITY BY DESIGN’S five-year milestone is #PeaceTogether, which is focused around celebrating the incredible amount of money raised and how the company has been able to do so by sharing time, resources, and talent to help elevate the missions of the non-profits they work with – including JAF! We can’t believe it has been two and a half years since we started our incredible partnership with ALEX AND ANI | CHARITY BY DESIGN, when we launched our “Positive Is How I Live” bangle specifically made for the Foundation. To date, ALEX AND ANI has donated over $390,000 from the sale of JAF bangles – meaning, together, we have been able to assist more than 550 cancer patients and their families since the start of our partnership. Simply incredible! Click here to learn more about how JAF celebrated ALEX AND ANI’S amazing accomplishment! On February 4, the Joe Andruzzi Foundation recognized World Cancer Day – an initiative that gives the world the opportunity to spread awareness of cancer on a global scale. This day aims to prevent millions of deaths each year through education and by raising awareness about cancer and early detection. By encouraging individuals, groups, government and the media to take action, we get the world talking about cancer. Cancer is a global epidemic with a staggering 14 million diagnosed and 8.2 million deaths around the world each year. Cancer does not discriminate, it affects people of all race, social class, gender, age, size and shape. That is why February 4 has been designated World Cancer Day: a day to unite the world’s population in the fight against cancer. Read our blog post to learn more about how you can raise cancer awareness everyday – not just on February 4. Help Support #TeamJAF Runners in NYC and Boston! As many of you know, on April 18, 2016 – Marathon Monday – Team JAF runners will take strides against cancer through the streets of Boston for the sixth straight year! Nineteen runners will be making up the 2016 team – a diverse group of cancer survivors, athletes, veteran marathoners and those running in memory of loved ones, including: Matthew Birnie, Valerie Chirichiello, Kelly Fisher, Barry Foland, Jodie Hooper, Katie Horan, Kristen Knight, John Lapointe, Kathleen Lussier, Don McCarthy, Matthew McKay, Maureen O’Connor, Sarah Parsons, Amy Pepe, John Ponte, Jim Pustinger, Dave Santoro, Sarah Sceery, and Susan Sly! But before our Boston runners hit the streets this Patriots Day, our New York City Half Marathon runners will be taking over Manhattan on Sunday, March 20! That’s right! For the second time ever, we’re sending Team JAF charity runners to the United Airlines NYC Half Marathon – and for the first time ever, Team JAF is also fielding awareness runners to don the Joe Andruzzi Foundation’s NYC Half Marathon singlets during the race to help spread JAF’s mission throughout the New York area! Already have an NYC Half bib – or are you a qualified or invitational runner looking to help out a worthy cause? Apply here to join the team today for free! Whether it be a veteran charity runner lending their expertise to our mission, or a newcomer experiencing this process for the first time – all Team JAF NYC Half runners have the same goal: to help assist cancer patients and their families when it’s needed most. To make a donation to one of our Boston Marathon or New York City Half charity runners, visit: www.TeamJAF.org! Join the JAF Smile Brigade! Providing cancer patients with help, hope, and a reason to smile has always been at the core of the Joe Andruzzi Foundation’s (JAF) mission – but the need is never-ending, and that’s why we are hoping you will join our JAF Smile Brigade: annual donors committed to helping defeat frowns all across the region! Think of how far $700 can go to help with a monthly mortgage payment, or what $500 could do for a family struggling to make rent during treatment cycles. Think of last winter, and how $250 could have alleviated the strain of a monthly gas or oil bill. Even $100 can help families pay their phone bill, and $50 can provide much needed groceries. And that’s why we need your help to alleviate cancer’s financial burdens on patients and families so they can focus on what really matters: getting better! We want to thank Patriots co-captain and cancer survivor Nate Solder, our gala’s keynote speaker, for bravely sharing his own experiences with cancer – including the diagnosis of his four-month-old son, Hudson, which was revealed to our gala crowd. 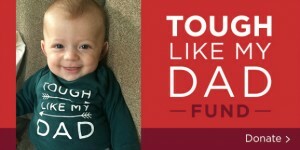 Nate, a testicular cancer survivor, and his wife, Lexi – both long-time supporters of JAF – have asked that those wishing to support Hudson’s battle make a donation towards the Joe Andruzzi Foundation’s Tough Like My Dad Fund, appropriately named after the adorable photo of Hudson the Solders shared with the gala audience in November. Proceeds of the Fund have already exceeded $27,000! Thank you for your support of Hudson and JAF’s mission! The Joe Andruzzi Foundation’s will return in 2016 to the beautiful Pinehills Golf Club in Plymouth, MA on June 27th, 2016 for our 8th Annual Joe Andruzzi & Friends Golf Tournament, presented by East Commerce Solutions, Inc. Check back next month for details on foursomes. For questions regarding sponsorship opportunities, please contact events@joeandruzzifoundation.org. We invite our New York-area supporters to join us this spring for an evening of cocktails and conversations in Manhattan as we introduce ourselves to one of our most rapidly growing patient communities.The event – to be hosted at NYY Steak’s Manhattan location (7 West 51st Street) – will give our New York supporters a chance to hear directly about the Joe Andruzzi Foundation from its President, Joe Andruzzi, and Executive Director, Jen Andruzzi, along with area patient recipients the Foundation has previously assisted. Stay tuned for more info and details about the upcoming Spring 2016 event! LTC Michael Greene of Mansfield, MA passed away peacefully on February 10, 2013 after a courageous 18 month battle with cancer. His wife, Kate Greene – a former #TeamJAF Falmouth Road Race runner – is training for the 2016 Tough Ruck on April 15th in his honor. 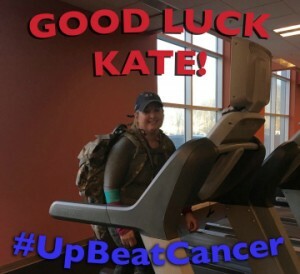 Please help us wish Kate a JAF-sized GOOD LUCK!